Emails are arguably the most effective ways to communicate with your employees on the one hand, and your clients on the other. They have touched almost all parts of our lives, so much so that there is hardly any area where emails do not have a role to play. So, whether it is official work or personal work, you will find emails to be of utmost importance. Even accessing social networking sites like Twitter or Facebook is not possible unless you have an email account. For businesses therefore, emails are absolutely indispensable. Without professional email hosting, your mails will not have the proper impact. When you send emails from free email accounts like the ones in Gmail or Yahoo, they lack credibility. However, when you have a business email account which bears your name alongside your company’s name, it helps to add credibility and establishes a brand image. 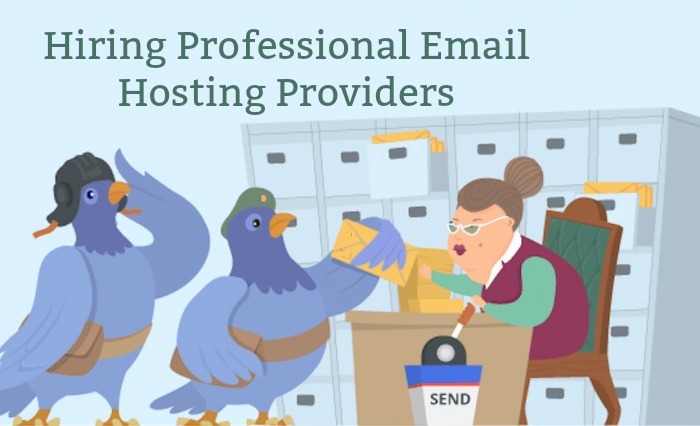 Why do You Need Professional Email Hosting? Regardless of the growing importance of social and digital media, emails remain the most important medium of communication for businesses and individuals. Businesses receive and send thousands of emails every day and managing these is not an easy task. This is why you need professional email services to take over the management of the mail servers. A business email will contain the company address or your domain name together with your own name. So, this id helps to establish your authority as a representative of the company. When your clients find your company name, they can look for the URL to get more information about products or services that catch their eye. - Business emails will not only make the communication professional, they even consolidate the brand image. When you send proposals through free email accounts, they are not likely to have an impact. However, when sent via professional email hosting accounts, they will appear far more professional and appealing. - Secondly, when you choose professional email hosting solutions, you are likely to be trusted more by your clients. The domain name present in the email address will allow customers to know about your products in details. Anonymous emails which do not contain the domain name are usually not trusted because customers cannot verify company details. - When you sign up for email hosting plans, you can save costs. While you will need to pay monthly charges, these are quite affordable compared to the advantages you get from them. For instance, you will be able to enjoy customized storage space. With white-label hosting solutions, you can even have your company logo on the account. This also promotes brand image for a company. - With professional email hosting, you stand to gain a lot advantages because of the advanced features they offer. Unlike free email accounts, you can customize the mailbox depending on your specific needs. you will get benefits like email forwarding, mail archiving, mail monitoring and mail grouping which is not possible with free email accounts. Besides, you will be able to share tasks, contacts and calendars that help to improve productivity. - When you sign up for professional services, you can be certain that your data will be secure. These email hosting providers will ensure that data is encrypted while at rest and also in transit. So, any data which is sent to and from a server will be protected against hackers and unauthorized access. The providers will deploy effective anti-spam filters which are designed to keep malicious emails out of the mailboxes. Emails are typically protected by the 128-bit standard encryption and traffic also gets encrypted through the use of protocols like POP and IMAP. These are some of the most important reasons why email services are so popular these days. Employee productivity has got a huge boost because of professional email hosting. Employees all across the globe can now share important files and documents which ensure that projects get completed in time. They can also access, edit and even delete their emails when they are traveling or at home. Recovery of deleted emails is also possible when you choose to sign up for professional email hosting.